"Oh, Jasus, the ship is on fire!" The time is 8:05p.m. on 26 August 1843, aboard the first USS Missouri, at anchor in Gibraltar Bay. Thus begins the demise of one of the U.S. Navy's first steam ships, which would burn to the waterline by the early hours of the following day. But Missouri's story does not end with her sinking. For over eight years the proud and once-beautiful frigate defies British attempts to raise or salvage her, slowly forming a sand bar that threatens to ruin the most strategic harbor on the planet. This is the dramatic story of Missouri's loss and eventual recovery at the hands of a novice American salvage operator, and his innovative use of technology to accomplish that end. It is a story you will not have heard, for it has never before been told. "Chuck Veit's new book highlights the tragic, short-lived existence of one of the U.S. Navy's first steam frigates. Raising Missouri tells the story of the underwater technical challenges involved in the early years of modern diving & salvage efforts, and how they were overcome by dogged determination and Yankee ingenuity. An intriguing read!" "History recovered! In 1843, the newly-built 229-foot steam frigate USS Missouri burned and sank, blocking the harbor at Gibraltar. That was not the end of her story, as Chuck Veit dramatically reveals. This is a tale of Yankee bravado-about an American who stepped up to do what British engineers could not. Readers will also explore the challenges that faced divers, and challenged salvors. A roaring good tale!" "Chuck Veit in Raising Missouri has put together a tidy little volume detailing a little known footnote of American naval history – the sinking and salvage of USS Missouri. This is Veit’s third book and continues in the vein of his focus on 19th century American naval history. Veit utilized the self-publication platform Lulu.com to bring this work to fruition. Without self-publication venues such as Lulu.com such a book might not have been brought into print and Veit should be commended for using Lulu to bring an obscure, but notable event to the reading public. "In the first two chapters, Veit details the planning, building and early life of Missouri – one of America’s first steam powered warships. In subsequent chapters, Veit goes on to describe the events surrounding the ship’s 1843 sinking in Gibraltar harbor and how she threatened to destroy the harbor’s usefulness as silt gathered around her remains. Next, the book documents the failed salvage attempts of Missouri and the bruise to the national ego that she inflicted. Interspersed throughout the book’s storytelling is the backstory of the development of steam propulsion and primitive diving suits. Veit’s description of 19th century diving and salvage efforts is especially intriguing for anyone interested in diving for work or pleasure. 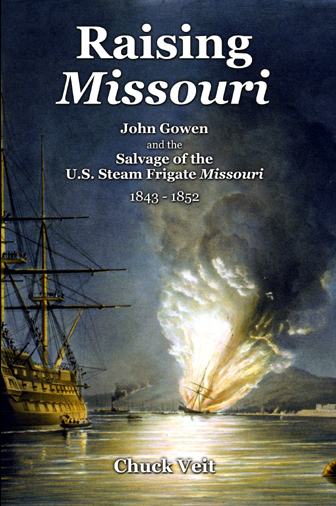 Finally, Veit concludes with the heroic against-all-odds salvage of the Missouri performed by American entrepreneur John Gowen. "Raising Missouri excels in its readability as well as the meticulous footnotes Veit provides. The book is also well-illustrated with helpful diagrams, period drawings and pictures as well as copies of primary documents. Considering that I prefer the use of footnotes over endnotes, I found Veit’s documentation excellent and incredibly helpful to the reader. Veit has obviously mastered the subject and exerted immense amounts of research to write the most accurate account possible of the events surrounding Missouri’s life and salvage. Readers desiring a quick, but highly engaging read would be well advised to pick up a copy of Raising Missouri."